Journalist Michaele Weissman has put together a great overview of the world of specialty coffee in God in a Cup . She traveled around the world with coffee buyers and explored the contrast between mass-produced, commodity coffee and artisan-focused, quality-oriented specialty coffee. This book isn’t really about searching for great tasting coffee, but uses that pursuit to frame the genesis and impact of specialty coffee for consumers and especially producers. While not strictly about coffee sustainability, it nonetheless brings alive many of the points that I strive to make here at Coffee & Conservation on the topic and the crucial role specialty coffee roasters make in this arena — and in turn how consumers can support it. As such, it lays the foundation for much of what I discuss here. Weissman preserves her artfully-paced narrative by placing the in-depth background information at the back of the book or in boxes, but still provides enough detail in the main text to clearly explain to readers unfamiliar with the coffee trade and the stakes involved. She does a great job of highlighting the passion — and activism — of the pioneers in this industry. Much of the focus is on her travels and interviews with three of them: Counter Culture’s Peter Giuliano, Intelligentsia’s Geoff Watts, and Stumptown’s Duane Sorenson, but many others are mentioned. This personal touch lends authenticity. It also keeps readers connected, as following these coffee buyers provides an opportunity to really understand the complexities involved in producing this crop and bringing it to market. Most revealing for me were the discussions about Fair Trade, and in particular the examination of the cooperative system. The example of the troubles Watts has had with poorly run organizations helps to illustrate that cooperatives (which are the only producers allowed to be certified Fair Trade) are not always the best way to protect farmers. I approached this book with a little trepidation, as I have read way too many articles about coffee that were superficial, not factual, lacked a fresh approach, or were just examples of lazy reporting. This was none of these. 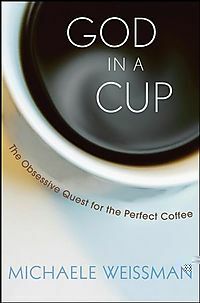 If you are at all interested in coffee (which you must be if you have read this far), I highly recommend this book. Further, get a couple extra copies for your coffee-loving friends, people you would like to convert to specialty coffee, or those in your life that don’t really “get it.” God in a Cup will make a great gift this holiday season. To get a sense of what this book covers and Weissman’s take on it, read this interview with her at Salon. She also maintains a blog which explores her ongoing coffee experiences. Then go pick up a copy of her book!